The three index-registers were meant to enhance the programming of loops. else different program-parts would interfere, using the same index register. A card-reading routine needed two indexregisters, one as a band-pointer for buffer-tranfers and one as memory-pointer. 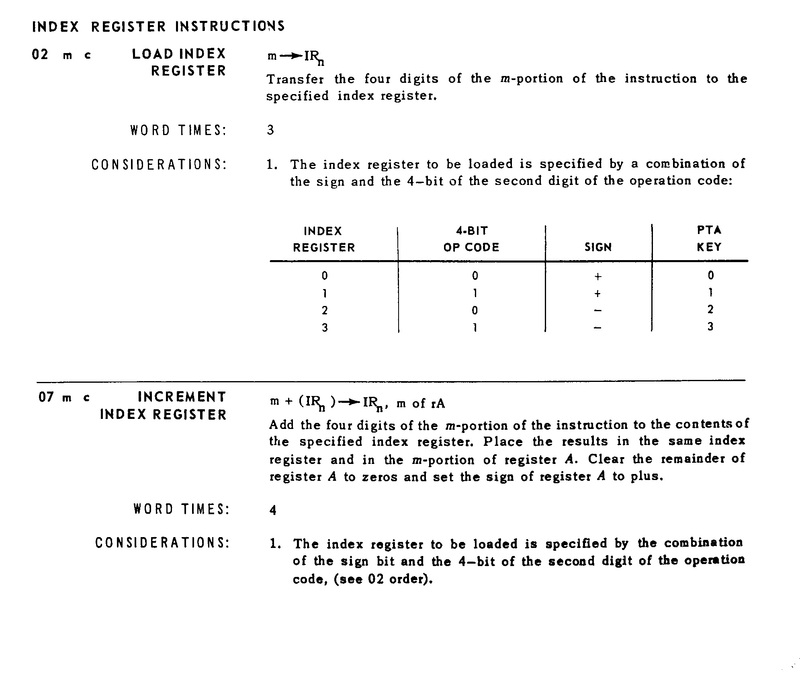 For the main-program there remained one indexregister. Our USSC was equipped with three index registers: IR1, IR2 and IR3. These indexregisters were optional. -  both, negative sign and 04                    = to make use of  IR3. On execution the content of an index-register was added to the operand address. When in such addition a carry occurred from a 100 addition, it was ignored:  0187+0015=0002. This caused that indexed operands were always addressed within the same band. All instructions with an operand-address or a band-number in M could be indexed. Instruction 02 loaded an index register with (M). - 0Y 0500 1123		to load 500 into IR3. Instruction 07 incremented the content of an index register with (M). +0y 0012 0590		to add 12 to (IR1),  ( y stands for (7 AND 4) ). - 0y 0012 0590		to add 12 to (IR3). Instruction 07 also placed the sum in M of rA for end-of-loop comparisons. To decrement the value in an indexregister an addition with the numbers complement of 10000 or 200 was made. +0y 0197 0590		did the same.